There are so many things great about it: cinematography, music, perfect cast, including Koscina who had success in Hollywood productions. It's also important to note that this was the first cinematic incarnation ever made of the famous Greek hero! But most of all, it introduced Steve Reeves to the world and action films weren't the same since. No matter how many Peplums I watch l always come back and watch this film. By the way l prefer the American dubbed voice more than the English dubbed voice. Wayne W.
It is a wonderful film and I think the sequel is even better. They are great to see back to back. Embassy Pictures reissued them together in 1973 and it was a real treat to see them on the big screen again. "It's also important to note that this was the first cinematic incarnation ever made of the famous Greek hero!" Actually, this isn't *entirely* true. The whole thing's a "battle of the sexes" comedy, though, not a serious treatment of the myth. Hercules was played by Tiny Sanford, who was a big, overweight guy who played comic bullies for the likes of Charlie Chaplin and Laurel & Hardy (and may have inspired Popeye's nemesis Bluto). 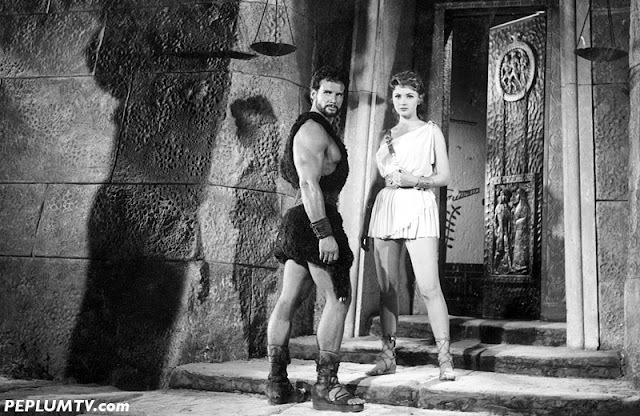 Steve Reeves, however, was the first "real" Hercules, as far as I've ever been able to determine. And kudos on this great series of posts saluting the 60th anniversary! In THE WARRIOR'S HUSBAND, Hercules is just a supporting character. HERCULES is the first film adaptation based on his life/myth.